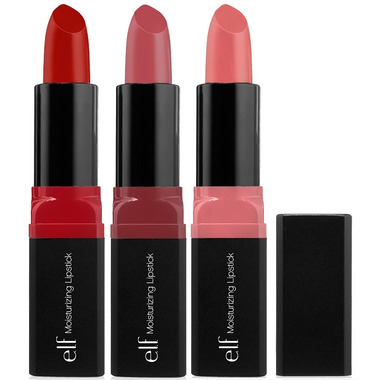 The velvety, satin texture of e.l.f. Studio Moisturizing Lipstick glides on lips with vibrant color and luminous shine. Enriched with Shea and Vitamins A, C, & E to nourish and hydrate the lips. The rich, creamy formula seals in moisture for long-lasting wear and comfort. I really like this lipstick. Love the colour, it does not bleed and it is not sticky. Goes on smooth. Will get more colours for sure. I recommend. I found it to go on smoothly and felt creamy at first. However it dried out rather quickly on me and therefore the creamy texture was shortlived. Good lipstick at a great value! I do find it needs a boost with some lip balm, though, to keep from drying out. The pigment is light and buildable. I like the lipsticks just fine, but taking one star off because Pink Minx is not actually pink; at least on me. It's a very pretty coral colour with some sparkle, but not pink. And not what I was looking for. I really like the colour (Pink Minx). But I don't find it very moisturizing, so I use a gloss on top and it's just fine. I really like the color I chose as it suits my complexion quite nicely. However, I found it a bit dry on my lips and did not go on as smoothly as I had hoped. the bomb ! lovely goes on creamy ... love the natural color ! E.L.F. ROCKS ! Great lipsticks. Long lasting and moisturizing..so far I'm in love with ravishing rose and cheeky. And recently bought wine tour but not a great colour for me if too much is applied. It's a lot more of a brighter purple then advertised on well. I suggest to check with e.l.f website which i later notice showed a more accurate idea of what the colour actually looks like. It's a great brand and I only wish Well sold more of their products!!!! Unfortunately this product was a miss for me. The formula was a bit gritty and the color was off as well. It seemed to accentuate lines and did not wear well. Love the product. Wish there were more colours. Love all the color, better than mac, the ones i was used to utilize. I got pink minx and it was definitely brighter than I thought it would be but overal it's great. It has amazing staying power and great pigmentation. It can stay on for hours. At only $5, it doesn't hurt to try them all! e.l.f. Studio Moisturizing Lipstick is true to the name, it is very moisturizing. Red Carpet: A wonderfully fun colour, with an orange undertone. I prefer a blue undertone, but this was still great. A bit greasy, so is best if you set it with a bit of powder. Pink Minx: Brighter than I expected, but goes on and stays on, less greasy than the Red Carpet. Cheeky: More of a neutral colour, which I love, but with some shimmer. The other colours I tried went on mostly matte. Not a fan, went on sort of cakey and was perhaps to bright for my taste. I really love this lipstick in Ravishing Rose - it goes on mat and doesn't make my lips look too glossy. Nice lipstick it is very moisturizing on the lips wish it would last a little longer. I love this lipstick! I don't normally wear makeup but a friend told me to try this because I always have chapped lips and lipstick usually looks like **** on me. This makes my lips softer and they don't look chapped. I ordered the red carpet colour which was very rich, just as shown. I found it more like a moisturizing matte colour, wasn't very shiny, but I also did not put too much on, due to the shade. It creased up a bit on the lips, but it's been lasting me all day at work, through snaking, eating, and drinking. It's not as vibrant as before, as is to be expected, but surprisingly it's still on after a full work day. Full 5 stars and looking forward to purchasing other colours as well. I love this lipstick and it is a great daily staple. The colour is long-lasting and works very well even on my dry lips! In addition, the product is not tested on animals. I don't wear lipstick very often but I am very happy with this product. I bought Ravishing Rose. What a gorgeous lipstick! This compares with any that I've bought at high-end makeup boutiques. I absolutely love it, in fact so much so that I've come back to well.ca to buy all the other colours. Amazing find! Moisturizing, lots of colour-payoff, looks great, feels wonderful. What more can you ask for? I gave it a 4 out of 5 because they don't seem very moisturizing to me, but they are nice colours. I purchased this lip colour in the shade Pink Minx. The formulation is definitely moisturizing and I find it to be quite pigmented and long wearing. While I do prefer a more matte finish, this one doesn't typically have a lot of 'sheen' so I enjoy that.